When it comes to discussing the mechanics of comedy, many of the terms are borrowed from music: Comedic routines follow certain rhythms; sitcoms and sketch shows have beats; jokes can hit a range of distinct notes. The spillover has as much to do with nailing down the often ethereal qualities of comedy and music as it does with both mediums’ dependence on repetition. Regardless of if they trade on refrains or running gags, a work like a pop song or a Police Squad! episode plays on the audience’s instant familiarity with—and willingness to hear again—a melody or a joke that hits hard the first time and grows bigger and more alluring with each additional iteration. Of course, repetition’s a double-edged sword in music as well as comedy. Hooks loose their sugar-rush appeal after a while, and jokes cease to be funny when they’re told too many times. The key to finding something that doesn’t wear out in, say, popular music or a television sitcom is arriving at a simple idea with a maximum potential for variations. The first pop-music example that springs to mind is Hal Blaine’s drum intro to The Ronette’s “Be My Baby,” a masterwork of syncopation that’s as vital today as it was in 1963; and if you don’t believe that, just browse this Wikipedia article of songs that borrow Blaine’s iconic beat. 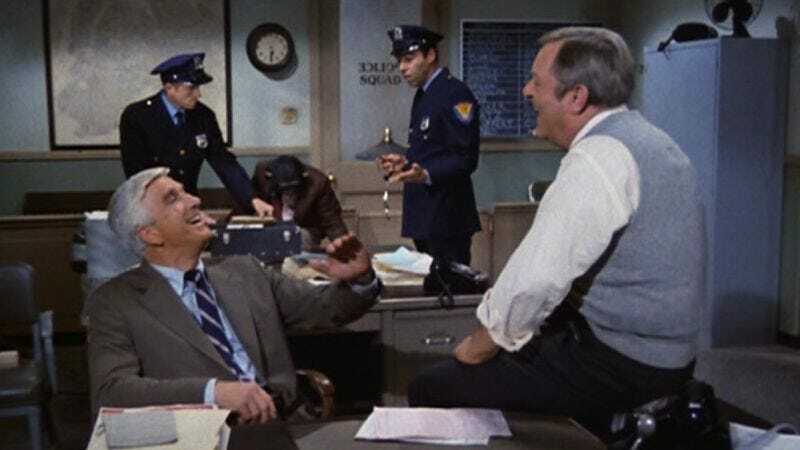 The conventions of Police Squad! have a far more limited range than those four echoing drum beats; in their way, running gags like the “Act II” titles and the growing list of criminals doing time at Statesville Prison are like “Be My Baby” co-songwriters Jeff Barry and Ellie Greenwich reformatting that song’s memorable shuffle to drive The Shangri-Las “Leader Of The Pack.” The surroundings change, but the framework remains as dependable and delightful as ever. And when the audience is already expecting a joke like “Act II: Ball III,” the payoff is even greater. “The Butler Did It (A Bird In The Hand)” is the point where the structured, regimented nature of Police Squad! truly sinks in. In the oft-repeated, usually paraphrased words of Auric Goldfinger, “Once is an accident. Twice is coincidence. Three times is an enemy action.” So it goes with watching Police Squad! : Ending “A Substantial Gift (The Broken Promise)” with a fake freeze frame is clever; using the same device for “Ring Of Fear (A Dangerous Assignment)” is something the viewer ought to notice—and connect it to the first instance. By the time Frank and Ed are standing stock still as the credits roll on “The Butler Did It” (while a murderous chimpanzee rifles through the contents of an officer’s desk), the show has set a pattern. It’s an action of comedic aggression, a Zucker, Abrahams, and Zucker signature that takes aim at the monotony of less-ambitious cop shows. Similarly, until Olson and Johnny turn up in this episode, there’s no telling whether or not they’re going to be a part of all of Frank’s investigations. And though we now know where to expect these characters to factor into the last three Police Squad!s, there’s still promise of surprise in how they’ll factor in. The balance between expectation and surprise—sure we know Johnny’s next customer will require highly specified information, but who could predict that customer will be longtime Los Angeles Dodgers skipper Tommy Lasorda?—is a precarious one, and “The Butler Did It” maintains it well. That’s mirrored in the way the episode offsets some of the loudest, bulldozing visual gags of the series (“We have men working around the clock looking for your daughter”) with subtle, elegantly handled jokes like the goldfish that appears in a partygoer’s water glass at the top of the half-hour. Unlike “Ring Of Fear,” “The Butler Did It” feels like Police Squad! firing on all cylinders. That could be because the episode plays out of order: The case of Terri Burton’s kidnapping was the third Frank Drebin adventure to make it to air, but it was the second-to-last episode produced. With two additional episodes under their belts, the producers, writers, and actors had a better grasp on how Police Squad! should behave, and it shows in a pair of standout sequences. The first is the episode’s famed “Japanese garden” scene, spectacularly played by guests Lilibet Stern and Ken Michelmen—as well as the three generations of Japanese extras standing motionless and silent in individual plant pots. The scene is written as innocuous and expositional as any police-procedural prologue, with Stern and Michelmen’s conversation detailing the stock terms of their characters’ relationship: Terri and Kingsley love each other, but she’s not ready for marriage. It’s a staid exchange staged in a totally bonkers setting, and neither character calls attention to the strangeness of the backdrop. To add the exclamation point to the scene—well, the one that doesn’t involve Terri being dragged away by a shadowy figure—Kingsley plucks the collar off the older male “plant,” and Terri takes a wistful sniff. There’s no straight-versus-absurd dynamic on Police Squad!. Every character has come to terms with the absurdity of their world, and they’re entirely content to stop and smell the menswear. If anything, “The Butler Did It” makes the audience its straight man. We’re the ones with the preconceived notions of how television works and how TV cops conduct investigations, so we’re the ones with the outsized reactions to Lieutenant Drebin interrogating a suspect during a pickup basketball game. If you’re looking for evidence of Leslie Nielsen’s epic commitment to deadpan (a skill sacrificed for interminable mugging later in his career), look no further than the scene below, a juggling act that requires the actor to recite tangled threads of suspicion and inquiry and guard Michelmen during a pickup basketball game. The blocking helps him out: The rest of the court is a frenzy of athletic activity, which distracts from the fact that, in the longest takes, Nielsen’s merely bobbing side to side. That these scenes manage to be funny with next to zero jokes in the dialogue is all the more remarkable. Police Squad! thrives on material we’ve seen a million times before; this is why juxtaposing mundane, workmanlike scenes with outlandish settings scores so many laughs. Drebin has given the third degree to so many previous suspects that he can question Kingsley and post four points and a steal at the same time. (Unless that jumper counts for three—in which case Frank walks off the court with five points.) “The Butler Did It” shows us something familiar (even the outcome of the case is overdone, not to mention alluded to in the title), but twists it into something new. The specifics are crucial here: Terri’s kidnapper may be hiding out near the docks, or he could be at a filling station near a high concentration of tubas; we know Olson isn’t above human testing, but it’s a specific human with a specific name this time (little Billy’s next-door neighbor, Dr. Murray Schoenbaum); when Ed asks for cover during a shootout, Frank throws a blanket over him. It’s the extremes to which Police Squad! goes that allow it to repeat itself without [pause for comedic effect] repeating itself. Concerns for continuity aside—the “Statesville Prison” roster features two criminals we haven’t met yet—playing the episode out of order is right in line with the show’s sense of humor. The shows it parodies were likely to have their running orders jumbled when they made it to syndication. Police Squad!’s finest: Aside from the moments mentioned above, I love Ed’s response to Frank requesting to see the “scene of the abduction”: Naturally, he shows him the dailies of Terri and Kingsley in the Japanese garden. Internal affairs: Frank’s questioning of a lakefront aerobics class looks to be the second beat of his feats on the basketball course, but it just ends up a cheap excuse to insert some T&A into the middle of the episode.